It's hard to resist Rice Krispies Treats®. They taste so good and they're so easy to make. Because I like them so much, I decided to make Chocolate Rice Krispies Treats®. They are just like the original Rice Krispies Treats® only we add three different kinds of chocolate (unsweetened cocoa powder, semi sweet chocolate, and chocolate chips). Delicious. We can thank Mildred Day for Rice Krispies Treats®, a Kellogg's® Home Economist who invented them back in 1941 when she needed something for a Camp Fire Girls' bake sale. Kellogg's® must have known they were on to something big, because shortly after their invention they started printing the recipe for Rice Krispies Treats® on every box of Kellogg's Rice Krispies®. The basic recipe for Rice Krispies Treats® has changed very little over the years. Oh, some of us now prefer to use butter, in place of margarine, and we may tinker a little with the ingredients, but its original flavor and texture are still there. While my personal preference is to use miniature marshmallows, large ones are fine, as are homemade, or you can even use a 7 ounce jar (198 grams) of marshmallow creme. But try to fresh marshmallows (so check the expiry date on the package) as they melt so nicely, and make sure to butter, oil, or spray, with a non stick vegetable spray, the baking pan, the saucepan, the bowl, and all utensils, as this mixture can be a little sticky. 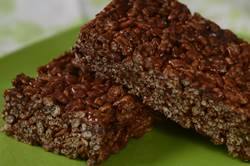 Chocolate Rice Krispies Treats®: Butter, or spray with a non stick vegetable spray, a 9 x 13 inch (23 cm x 33 cm) baking pan. Place the Rice Krispies® in a large bowl that has been buttered or sprayed with a non stick vegetable spray. Butter, or spray with a non stick vegetable spray, a medium sized saucepan. Melt the butter in the saucepan over medium low heat. Add the cocoa powder, chocolate, salt, and marshmallows and stir constantly until the marshmallows have completely melted and the mixture is smooth. Remove from heat and stir in the vanilla extract. Pour the mixture over the Rice Krispies® cereal, add the chocolate chips, and stir until all the cereal has been completely coated with the marshmallow mixture. Pour the mixture into your prepared pan and lightly pat until even. Let sit at room temperature until set. Cut into squares. Well wrapped, the squares can be stored at room temperature, or in the refrigerator, for two to three days. Rice Krispies Treats, Rice Krispies and Kellogg's are trademarks of Kellogg's NA Co.